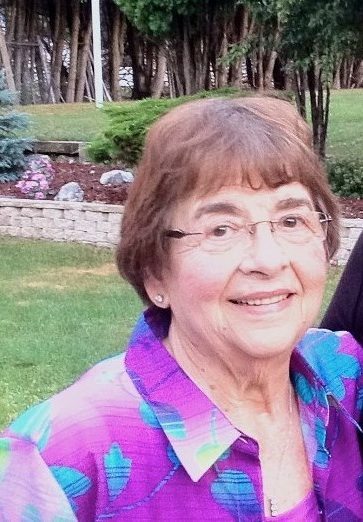 IRON MOUNTAIN — Elena “Helen” Muller, 85, of Iron Mountain, passed away Wednesday, Aug. 30, 2017, at her home. She was born on July 19, 1932, in Iron Mountain, daughter of the late Orsio and Angeline (Carollo) Cavicchioni. She married Ewart “Neil” Muller Jr. on Sept. 4, 1965, at Immaculate Conception Catholic Church, Iron Mountain. He preceded her in death in 2002. She started working in her family’s flower business, “The City Greenhouses,” on the North Side of Iron Mountain at a young age and continued working there with her father after she graduated from Iron Mountain High School in 1950. The “Greenhouse” was always a special gathering place for friends and neighbors, all of whom Helen loved like family. Her door was always open, and every guest was greeted with a kind word and some of her delicious homemade food. Helen was a talented floral designer, and after her retirement, she continued to share her passion for flowers by volunteering a great deal of her time to decorating the Immaculate Conception Catholic Church where she was a lifelong member. She was a very caring person and dedicated her life to helping others. Helen spent many years as a caregiver to her family and also donated many hours of her time to the St. Vincent de Paul Society. She is survived by her daughter, Melissa (Scott) Muller-Green and their sons: Nathan and Aidan, all of Tucson, Ariz.; one sister, Jeanna (Joseph A.) Ferraro, Iron Mountain; three nieces, Suzanne Cavicchioni, Gayla Valle, and Jane Golchoff; one nephew, Joseph T. Ferraro; two great-nephews, Joseph Valle and Max Valle; and one great-niece, Gianna Ferraro. In addition to her parents and her husband Ewart, Helen was preceded in death by her in-laws, Ewart Muller Sr. and Violet Muller; one brother, Joseph Cavicchioni and sister-in-law Nancy Cavicchioni. Visitation will be from 10:30 a.m. to noon Saturday, Sept. 9, 2017, at Jacobs Funeral Home, Iron Mountain. Prayers will be recited at noon at the funeral home. The Mass of Christian Burial will be at 12:30 p.m. Saturday at Immaculate Conception Catholic Church, Iron Mountain. Msgr. James Kaczmarek will officiate. Burial will be in Cemetery Park, Iron Mountain. You may light a candle in remembrance of Helen or leave a condolence for her family online at www.jacobsfuneralhomes.com. The family has chosen the Jacobs Funeral Home, Iron Mountain, to honor Helen’s legacy of life.